Besides Indonesia, the country with many inhabitants as India would be an attraction for the world's automotive manufacturers. No wonder, if the new models are always present to tempt the consumers in the country. Interestingly in addition to the cars made in Japan and Europe, India also has a lot of potential to bring the unique products. One of them, DC Tia, a hybrid car that will soon be introduced in India. Yes, this car is very unique. In addition to cute, this car also has a strange design. 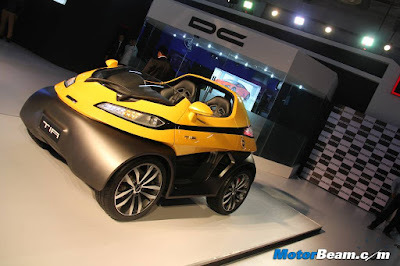 This hybrid car is one of the cars which made by DC Design, a company that is focused on making the concept car and prototype. As reported by the Motorbeam, DC Tia has actually introduced at the Auto Expo 2014 event earlier. And the plan, this car will be launched later this year and ready for mass production although in limited number. The unique city car has a wheelbase of 1,620 mm. The vehicle’s ground clearance stands at 200 mm. The body of the Tia sports carbon composite two-door coupe with a Targa roof and top of the Tia has been crafted beautifully especially the rollover hoof. Apart from these, the Tia has a short windscreen just like a motorcycle fly screen. The car with a capacity of two passengers is prepared to facilitate the mobility of its owner. 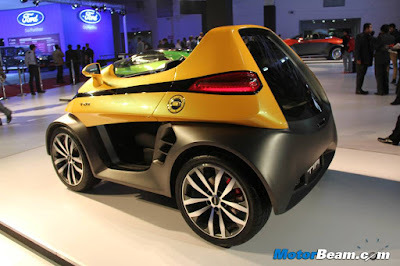 This car uses a 1.2 liter Euro 5 Turbo petrol engine that can give the power up to 120 hp and 190 Nm of torque. 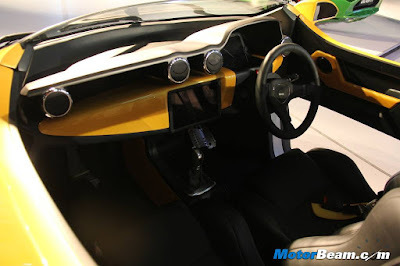 The car also can use the electric power that will be combined with a four-speed automatic transmission system.